You'll be £19.99 closer to your next £10.00 credit when you purchase The Gestapo's Most Improbable Hostage. What's this? So starts the story of Squadron Leader Hugh Mallory Falconer, British Special Operations Executive agent and prisoner of the Nazis for over two and a half gruelling years. When he was caught out of uniform by the Gestapo in Tunisia not long after the culmination of Operation Torch in 1942, he had no right to expect anything but the worst. Quite miraculously however, his papers vanished whilst he was being sent to Gestapo HQ in Berlin and, as a result, no-one could make out who he was. This, coupled with his quick-thinking and cunning whilst under interrogation, led to the Nazis including him in a group of high-profile hostages, holding him alongside such notable figures as the former French Minister Leon Blum. The group were intended to save the Nazi leaders' necks as the War ground down to its inevitable end. Offered a certain amount of protection on account of their special status in the eyes of their captors, they experienced the war from a unique vantage point. Held at a variety of infamous camps, including Sachsenhausen, Dachau and Buchenwald, Squadron Leader Mallory was taken on a virtual grand tour of the Third Reich, witnessing the full extent of its horrors. Then in 1945, he was forced to new heights of cunning when the Nazis began exterminating their captives. His daughter, who has painstakingly transcribed the only copy of her father’s memoirs, describes this book, published here for the first time, as ‘a personal manual on keeping your sanity when your weight has dropped to that of a small German Shepherd dog, you are covered in vermin, you are alone and you have everything to fear.’ It makes for vital and compelling reading. It's the kind of book you want to read at one sitting. This is a harrowing and inspiring tale and we must be grateful to the editor for her efforts to bring her father's memoirs to print. There is also a most fascinating collection of images in a photo plate section of people who have remained largely invisible before. Mallory effectively teaches about mental strength, the SS guard mindset, secret communications and how to never give up. His survival strategy is a shining example of how to overcome the worst odds, but not inexplicable – he really helps the reader to understand the stages he went through during his long imprisonment. 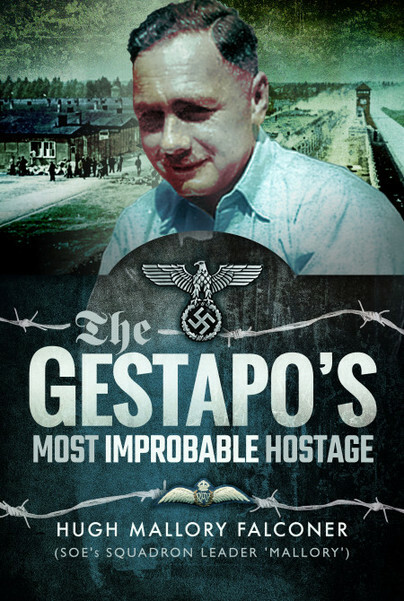 The Gestapo´s Most Improbable Hostage is a disturbing, inspiring book that also contains some unexpected but very British humour. This is such a cracking story - I nearly read the whole book right off. A real 'page turner' relating the first hand memoir of an SOE agent caught red handed by the Gestapo in Tunisia in 1943, then held in various concentration camps in Germany for two and a half years. The author tries in vain to understand how the supposedly civilised German people became the monsters who staffed the Gestapo, the SS and the concentration camps. His ways of surviving the camps was to apply his considerable intelligence. A remarkable testimony which I highly recommend. Born in 1910, Hugh Mallory Falconer was the son of a Presbyterian Minister who was elected Head of the Presbyterian Church in England. His mother was born in Hanover whilst her father was aide de camp to one of Queen Victoria's younger sons. He learned French at a Lycee in France then went to Cheltenham College, a major military public school. Frustrated initially in his wish to be a professional engineer by his mother, who thought that only a military career was suitable for a gentleman, he nevertheless found that the wireless skills he learnt in the Royal Signals and the French Foreign Legion were invaluable when he applied to join the Special Operations Executive. Post-war, he was placed in the British Zone in Germany, first reorganising German Passport Control, then doing another (unspecified) job in Hanover until 1952. Back in the UK he returned to his profession in the cement industry. From then on all his contracts were abroad in India, Pakistan and Iran. His job took him to Afghanistan, Kashmir, Bangladesh and many other parts of the world. It was during a two-year contract in Zambia, whilst visiting South Africa and Rhodesia, that he and his wife decided to settle there. He died in Rhodesia in January 1980.